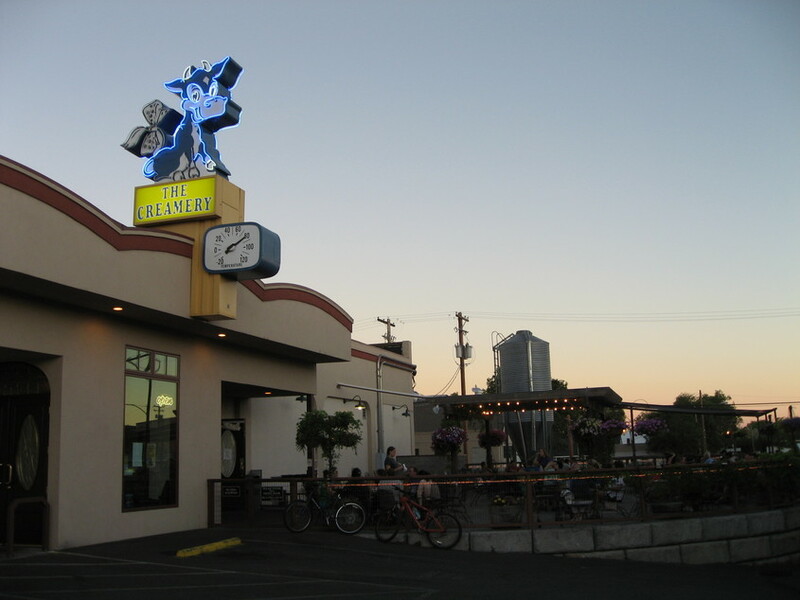 If you drive around Klamath Falls long enough you can’t miss “The Creamery” marked by a large powder-blue neon cow. This is the location of the Klamath Basin Brewing and Creamery Pub. The creamery is long gone, but you can still see the bricked-in remains of the loading dock portals – and their menu still offers a modest selection of ice cream treats. (for my designated driver and wife) I visited the brewery with family while on vacation in Northern California and Oregon. The Pub and Brewery offers a large, open seating area inside, but we decided to take advantage of the beautiful July weather and sit out on their patio and enjoy the hanging pots of annual flowers. Well, it is not really a July staple, but my favorite was their Cabin Fever Stout. Smooth, black and lightly hopped with the right balance of chocolate and coffee flavors rounded out by a slight fruitiness. This was my “post sampler” nightcap. A close second was their Drop Dead Red - a strong red ale with subtle complexity. Different grains step up at different times including caramel and just a touch of roasted malt, and it finishes slightly dry. An excellent interpretation of a style that can, at times, be a touch bland. Make sure and visit Crater Lake, which is less than one hour north. This lake fills a large caldera that was formed around 7,700 years ago. The setting is very unique and stunning. It is the deepest lake in the United States, and its pure water creates the deepest blue you will ever see. The area also offers countless opportunities for camping, hiking and spelunking.